A certain Bolt employee thought I was blowing smoke when I listed tshirts and sleepy pants as a part of my weekend list. Not So! I finished the pants on Sunday and granted, didn't get to the shirt until today, but still-- Take That, List. One of the only reasons to make my own tshirts is to find the right fit. Or to use up fabric. Okay, that's two reasons, but the main one is still fit and as I get older it gets trickier and trickier to find the holy grail of good fit and fabric combos in knit clothing. This is my first Jalie pattern (#965) and I will tell you right now that I did not follow it to the letter because, like I said, I was looking for the right fit. The fabric I used is from Bolt, it's 100% cotton and it was just less than 10 dollars a yard (which you only need one of, so Score!). It would also work great for a light weight hoodie. I traced out the whole pattern onto newsprint according to my bust measurement, which is larger than... er, I would like it. 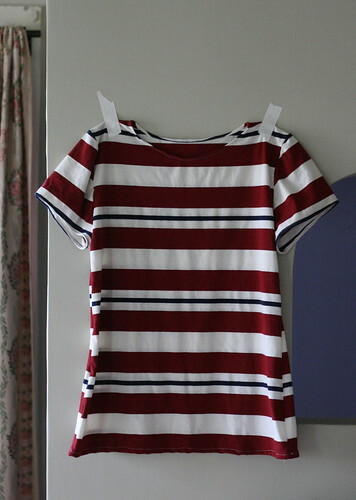 This is always the problem area for me (that and length), and if I buy a shirt to fit my rack, the armholes are usually too big and the rest of the shirt is saggy baggy. I retraced the shoulder going down two sizes and redrew the neckline to make it a little wider and a little deeper (to accommodate for the redrawn shoulders). I also added another 2" to the length. Cutting and sewing took less than an hour (I turned down the neckline and hemmed the sleeves instead of attaching ribbing). The shirt fit and I was generally happy with the sleeve length-- or would have been if I made it out of a solid fabric. 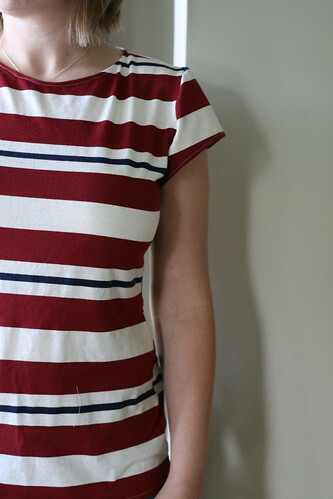 The stripes and the longer sleeves were a little too Cruise Wear for my taste and so I cut the sleeves down 1 1/2" from the height of the cap, blending down to the existing underarm measurements. Much better. Why didn't I just trace an existing shirt that I like? Two reasons: I wanted to try these patterns and see what all the fuss is about. I think the fuss is well-deserved. There are 24 sizes, the measurements are thorough and easy to alter and the instructions were clear. It did what it promised to do. Secondly, armholes and sleeves are the trickiest bit to almost every pattern and I have not had tremendous luck getting a good trace off of either when I've used finished garments. I wanted a pattern that I could whip out and finish in an hour. I'm going to try the tank top next time and attach ribbing-- I would have attached it this time but two sleeping children stood between me and my fabric and I was not interested in tempting the fates. I was already doing that sewing my own flippin' shirt.